For more than 2,000 years Florence has played a starring role in Italy's history. Home to the famous Medici family in the 1500s who not only redefined banking and reintroduced statecraft to Europe, but went on to influence the history of European politics by marrying into many royal families. Regarded as the birthplace of the Renaissance there are still many building remaining from this period and a stroll through these ancient streets is mesmerizing. Michelangelo's David is housed at the Accademia Gallery, and the vast Duomo di Firenze, Florence's largest cathedral offers incredible views over the city. The history, the architecture and the people of this incredible Italian city make it a must-see when travelling through Italia. Panoramic Earth - click here to see more panoramic images of the Duomo including Florence Cathedral Nave showing the massive expanse of the church, High Altar and cathedral dome, Altar of St Zenobius at the far end of the cathedral (not open to public), Florence Cathedral Mass Sacristy with wooden panelling (not open to public), View from Cupola overlooking the whole of Florence, Baptistery of San Giovanni with the mosaic ceiling, Florence from top of Giotto's Campanile (Bell Tower) showing a panoramic view over the city, Top Level and Penultimate Level of Giotto's Campanile (Bell Tower), images from inside the tower, Giotto's Campanile and South side of Cathedral showing the stunning polychrome marble decorations. 360 Cities - click here to see more panoramic images of the Duomo. A Story of Brunelleschi, Florence, Italy! The largest brick dome in the world still stands today, centuries later, in Florence, Italy due to the brilliant renaissance architect Filippo Brunelleschi who solved what no other architect of his time could solve! 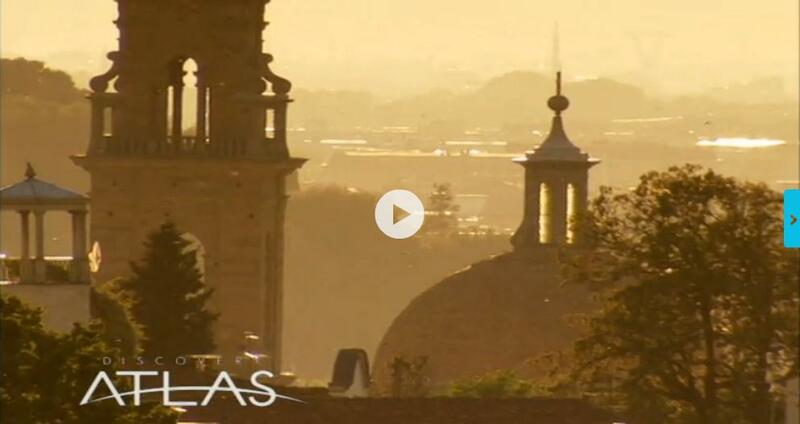 See the story in Jantiena Fieyra's program on Florence, Italy. Visit www.carpediemtv.com. 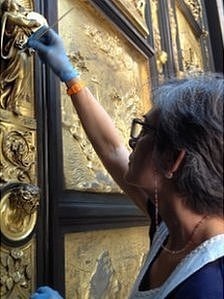 Click on the image to see a BBC documentary on the restoration of the renovation of Lorenzo Ghiberti's "Gates of Paradise"
Click on the image to see all 10 baptistery door panels. Called the 'Temple of the Italian Glories' for its tombs of Michelangelo, Galileo, Machiavelli, and Rossini (most of whom are featured in this slide show), Santa Croce was reputedly founded by St. Francis of Assisi and built from 1294-1442 CE in the shape of an Egyptian tau cross. Originally built on marsh land outside the city walls, it was severely damaged by floods in 1966, requiring extensive restoration. Accompanied by the ethereal 'Ave Maria' by Florentine composer Giulio Caccini, quotes from the Bible and John McCreery become philosophical bookends for the theme of spirituality.